This sounds interesting, a great way to share your summer holidays perhaps? And I should point out he was "doing webs" all the way to the shops and back yesterday when I took that photo so it's his first and 4th fingers he is pointing up. It's not a 2 fingers up to school LOL. 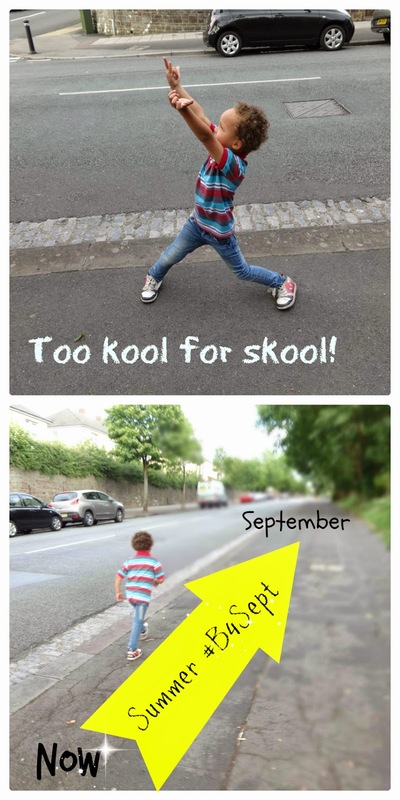 I can't wait for the summer holidays as I have to walk to and from nursery and school six times a day. It seems only minutes the time inbetween. I am not ready for school to start in the slightest for Erin! I'm excited about BB starting Reception, I'm more worried for his little sister who will be lost without him. They grow up SO much in that summer before school. I'm sure he will love it! He's is a very cool little boy, and cute! My son is having grand time with his dad and I'm home alone. I'm getting a lot of blogging done but I miss him terribly! Ooh does he start school in September? That will be us next year! I wish we could stop the clocks! Hang on to the summer sunshine for as long as we can. I can't wait for the school holidays. It'll be a happy day in my house when I can turn that alarm clock off for 6 whole glorious weeks!! I recognise the Spider-Man hands! I would love to live in an imaginary spider man world! I am so looking forward to some family time in the holidays.....is little man starting school? Lots of plans and fun activities for you before September and school starts. We are looking forward to the Summer holidays. Lots planned!